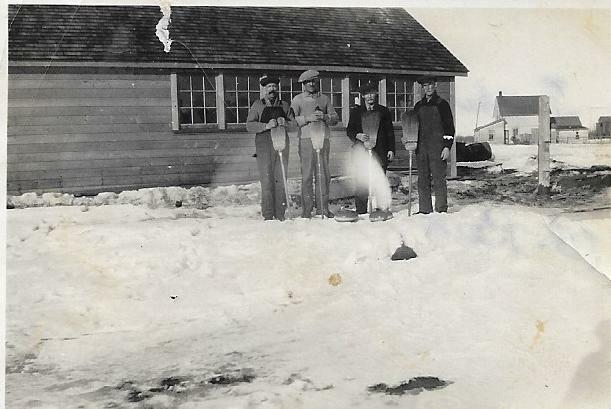 My family history is connected to the sport of curling as some rediscovered photos clearly show. There are not many pictures of weddings, birthdays or other special occasions but curling teams - oh yes! The old photos help me reflect on the leisure pastime of my ancestors and how the game has evolved. This picture was labelled Hargrave Ladies Curling 1926. The women are noted to be: back left - Florence Stinson and Evelyn Odell, front - Coral Wilson and my Grandma Frances Milne in the light coloured coat on top of her dress! This would have been taken before she was married in March of 1927. The local history book called Binding Our Districts, complied in 1989, says the curling rink had been discussed since November 1905 but was built in 1926 and used until around 1973. My great grandfather, Alexander Milne, was a keen participant as well. Being a Scottish immigrant, he likely played the game back in the "old country". The wide household corn brooms were widely used until narrower brooms and later ones with coverings that were called "Rink Rats" became popular. Brushes made with horse hair and hog hair came along in the 80's and then synthetic fabrics took over. Handles are now fibreglass or carbon fibre instead of the wooden dowel. 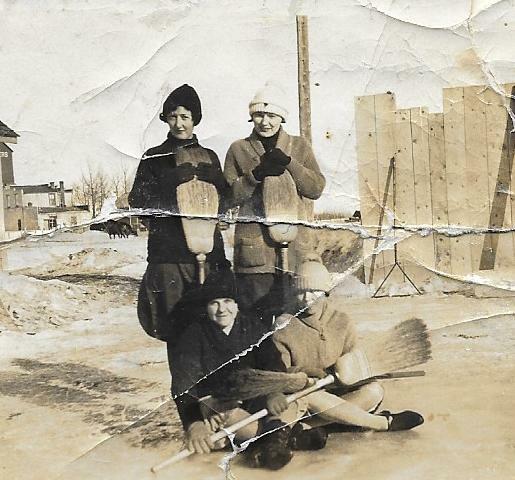 Famous curler John Morris has a video on YouTube here that shows the history of brooms. 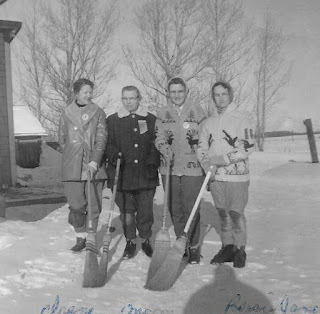 Amos Odell donated the land for the rink to be built in the summer and all of 1926 and a horse barn and well were also important to have on site. Windows helped with lighting during the day but gas lamps and later electricity kept the games going into the night. An open air skating rink was flooded on the south side of the building as well for hockey and skating. 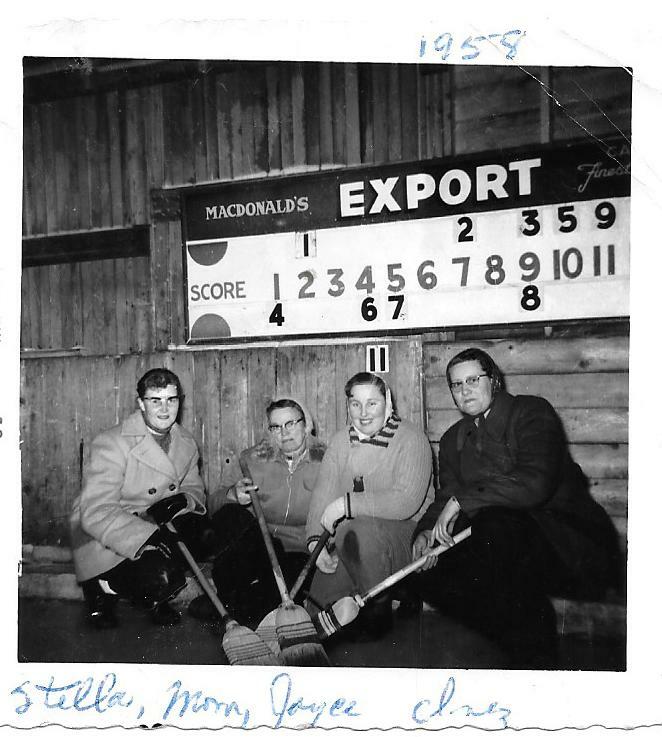 I recall the scoreboard sponsored by McDonald's Export A Tobacco like the one above were in every rink and were a challenge to decipher for the non-curler! Along with playing the game, my family was involved with the many volunteer duties to keep the rink going. 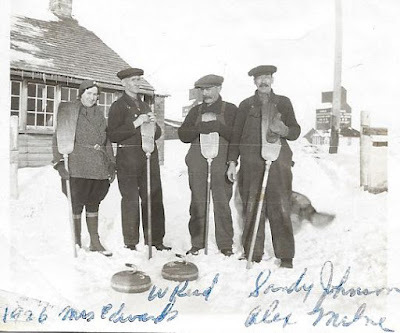 Repairs and upgrades to the building, serving meals and lunches of donated food, sawing wood for heat, serving on boards and as draw masters were all vital to the continued success of the Hargrave Curling Rink. 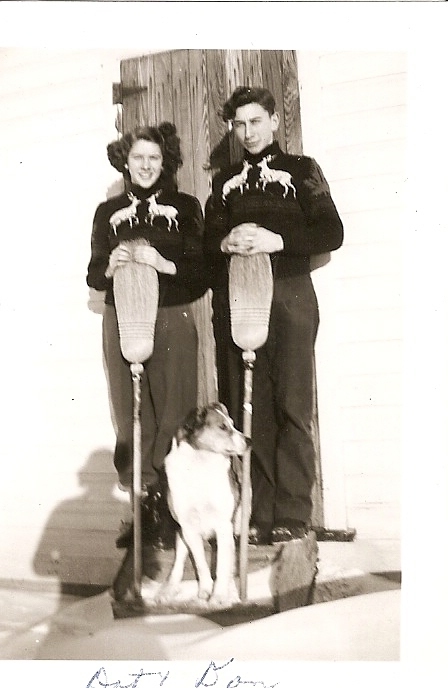 The curling sweaters being worn by Bessie and Janet were popular in the 50's and 60's. Mary Maxim or Cowichan is another name as talked about in this blog with many designs and patterns. A Google search of "Vintage Mary Maxim" give lots of examples. My Dad (above with his twin sister Dorothy and Skipper the dog) remembers when the prizes at bonspiels were huge. There was one at Nipawin, SK where the winners took home brand new Hudson automobiles! Listen to a radio broadcast clip here from January 1948 from the event that drew top teams from across the prairies to the Autospiels held from 1947-1954. Electric prizes were popular in the 40's and 50's and Rivers had one of these. Fancy trophies and prizes gave way to Cash Bonspiels and "Pick a Prize" affairs. My Grandpa, Frank Kinnaird, also enjoyed curling and the Pyrex dish pictured below was one of his prizes, my Mom recalls. The Pyrex Love Website shows the set in red and more about it here. It was advertised in the September 19, 1949 Life magazine and was found online at Google Books for the going price of $2.95! As to the future of rural curling, a March 2013 free press article tells of the struggles of curling and rinks in rural Manitoba. One of the many ways life has changed since the days of my ancestors. I am glad the pictures remain to remind us how it was. Nice write up.. curling is still in the family, with 5 Kinnairds (Lyle, Jay, Kris, Rea, Michael and a Kinnaird in-law (Sheldon Seafoot) curling in the Virden Bonspiel last week!